Wireless Security & Monitoring System with built in quad band GPRS/GSM Module. Enhanced capabilities to report via text message as well as traditional two-way voice! Up to 64 wireless sensors & 8 wireless relays can control any AC/DC functions on board. Call into your system from any phone to arm/disarm, speak with people on board or control relays. Packages available for any size vessel. Supports up to 64 wireless sensors for security and monitoring & 8 wireless relays to control any AC/DC functions on board your vessel. Monitor high water in the bilge, low voltage, loss of shore power, temperatures in bait & food freezers, smoke, intrusion and much more. Sophisticated, marinized deck pressure sensors, door contacts, dual optical passive infrared motion sensors and pull sensors alert you to intrusion or potential theft on your vessel. “Prevent the event” by programming a siren and flashing lights to go off when a sensor is triggered and get would thieves off your boat immediately. When an event occurs, the Phantom will call/text up to 8 phone numbers with a voice recording or text message letting you know the vessel’s status and the event that has occurred. Key fob control allows for easy arming/disarming and displays the system’s status using visual (LED) and auditory feedback. Up to 6 different functions can be programmed and the system’s stats can be checked with the push of a button. Remotely call in from any phone to check the system’s status, arm/disarm the system, control outputs (turn things on or off such as a lights, air conditioning or even your ice maker before a fishing trip! ), leave messages for friends and crew, or call in to have two way conversations with those on board through the units hands free speaker phone. Have contractors on your vessel working by the hour? Your GOST Phantom unit can be set to discreetly make calls to you when certain codes are entered to disarm the system so you know exactly who is on your boat and when they arrive. 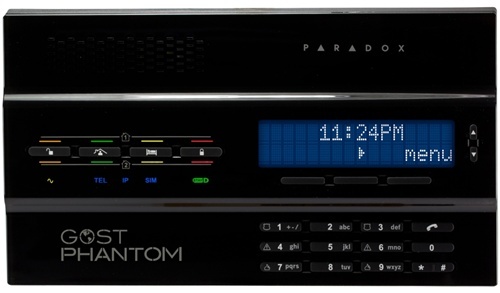 and repeaters seamlessly integrate into the GOST Phantom. Program up to 6 different functions per key fob to check system stats, control relays and more. The GMM-KF2 will keep the last system status received from the control panel in memory. Momentarily press the Info button to display the last system status even when out of range. Used to confirm the last action you did on the system while away from the system. The Phantom SM will help protect against intrusion and theft as well as monitor the shore power, low battery voltage, smoke detection and let you know if the vessel starts to take on water.